KABUL— Rawail Singh, a leader of Kabul’s Sikh community, is a big supporter of recently sworn-in President Ashraf Ghani : His Facebook profile features a photo of the president holding his 4-year-old daughter during a campaign rally. “If the new government of Afghanistan doesn’t pay attention to this issue, obviously one day there will be no Sikh or Hindu left in Afghanistan,” he said. Islam is Afghanistan’s official religion. Though the country’s constitution recognizes the right of members of other faiths to practice freely, and many moderate Afghan Muslims embrace diversity, Sikhs and Hindus say they often face intolerance of their religious practices and customs here. For this reason, community leaders say, many have left in recent years. 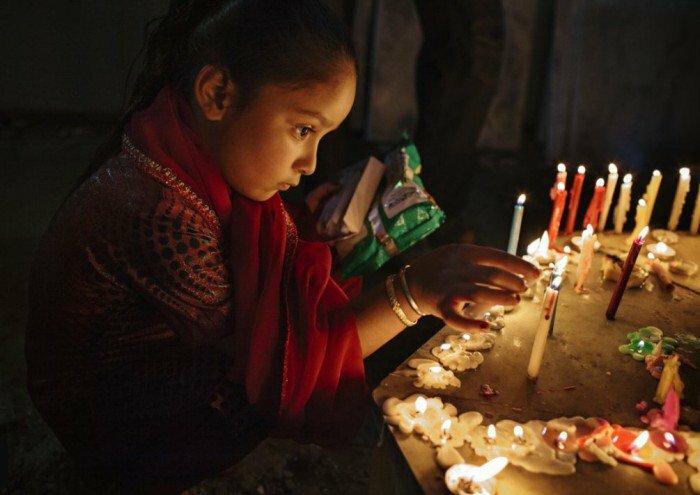 One autumn evening, Sikhs and Hindus lit candles as they gathered in a temple in Kabul for Diwali, the festival of lights that is their most important annual celebration. Every year, members of the community say, attendance at Diwali dwindles. So does their population in the country. No official data exists, but community members say they are down to around 7,000 people, the majority of whom are Sikhs, from roughly 200,000 before the country’s civil war began in 1992. Otar Singh, the head of Afghanistan’s Hindu and Sikh community and a former member of parliament, said conditions are worse under Afghanistan’s democratic government than they were during the Taliban’s severe rule in the late 1990s, when the minority group had to wear yellow arm bands that singled them out as second-class citizens. “Under the Taliban our rights were clearly defined, and people were not cruel to us,” he said. In a meeting with representatives of the Sikh and Hindu community in November, Mr. Ghani promised to address their concerns and reiterated that they’re entitled to the same rights as other Afghans, according to a statement from his office. He also vowed to allocate funds for the building of a temple in a district in the volatile eastern province of Nangarhar. Members of the community say they hope Mr. Ghani’s stated commitment to defend their rights may slow the departure. Since last spring, around 400 more Sikhs and Hindus have left, according to community leaders. Most joined the swelling Afghan community in India, their spiritual home, while some turned to people-smugglers in a bid to reach the West. Such voyages have ended tragically. In August, 35 Afghan Sikhs of all ages were discovered in a ship’s cargo container in the British port town of Tilbury. One of the migrants, a man, was found dead. The U.K. government is currently considering the asylum applications of the others, said a spokeswoman for the British Embassy in Kabul. 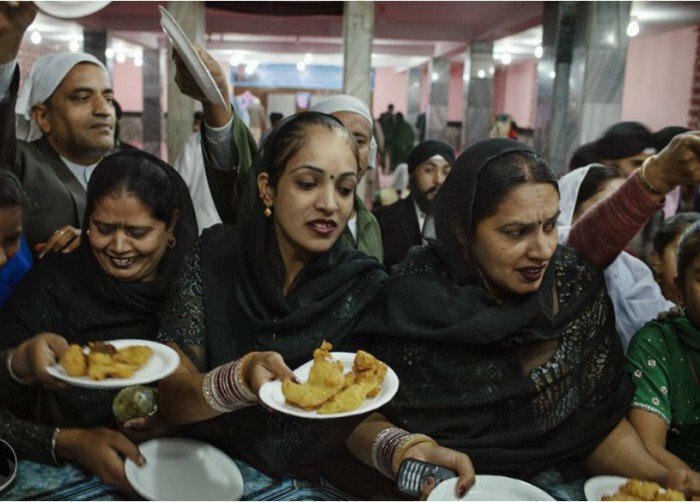 Afghanistan’s Sikhs and Hindus stay in small, tight-knit communities and participate in many of the same religious rituals held in a temple both faiths use. At home they speak mainly Punjabi, the language of Sikhism’s religious texts that is native to the Indian subcontinent. Many Afghan Sikhs feel they straddle two worlds without being fully accepted in either, however. The earliest evidence of the Afghan Sikh and Hindu community dates back to the 18th century, when they played a prominent role in the moneylending and merchant trade that linked Central Asia with the subcontinent. However, historians believe their presence predates that. These days, they are known for the medicinal herb shops that many of them own. Most live in Kabul. Sikhs living elsewhere in the country say the intolerance they face is particularly open. Of the 35 Sikh families who still live in Helmand, many are thinking of leaving, he said. The main collective grievance Sikhs and Hindus face is local opposition to the custom of burning their dead. Many Afghans see the practice as un-Islamic, and have sought to stop it, periodically calling out insults or throwing stones at Sikh and Hindu funeral processions. The community’s crematorium in Kabul is in a walled garden in what used to be the outskirts of town. But the city has swollen, and the site is now confined in a densely populated neighborhood. This has heightened tensions with locals in recent years. Sikhs now require police protection during funerals. But not everyone opposes the ritual. “They have their own religion and I have mine. They are good people and I have no issue with them,” said Mohammad Sharif, a Muslim security guard at the cremation site. Schooling is another recurring issue, Sikhs and Hindus say. Most families, worrying that their children will be bullied, refuse to let them attend state-run schools, opting instead for private schools or no school at all. Wisak Singh said that the children in his family, who also live in Helmand, are practically illiterate. “We are teaching them Punjabi at home, and we hired a private teacher who comes home to teach Pashtun and Dari,” Afghanistan’s two main languages.